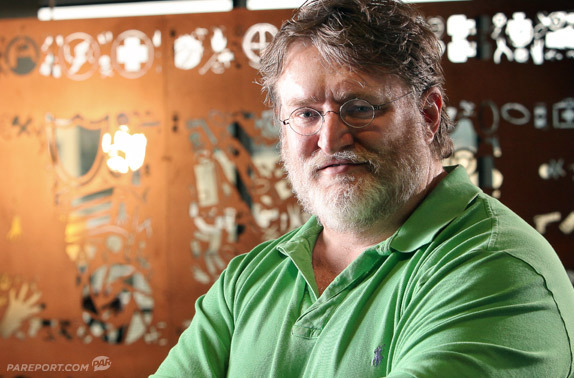 Gabe Newell is sporting a new look – he has grown a beard! And sort of resembles Santa Claus. That must be the reason behind Steam deals, surely? He also revealed in an interview with Penny Arcade that he owns an iPad 2. That isn’t surprising though, all cool people (like me) own an iPad 2! But seriously, he revealed a lot of new information in this interview – like how he finds tablets horrible for gaming, especially their control inputs. “So I use a tablet a ton, so if I could pick one magic wand I would have us all sit down and design a new, more gaming friendly tablet hardware interface and then build some content that really was designed at the same time as the hardware,” he said. I kind of agree with him; virtual analogue controls are a major pain, but I do enjoy unique experiences like Temple Run on the iPad 2. Let’s hope people innovate in the tablets area, and create proper controls, something like the Vita.